The Portland Sea Dogs are on the road and so is the Promotions Department. Heading to the beautiful campus of the University of Maine, Farmington to meet with our Poetry Committee! We will be picking our winners today of our first annual Poetry Contest. 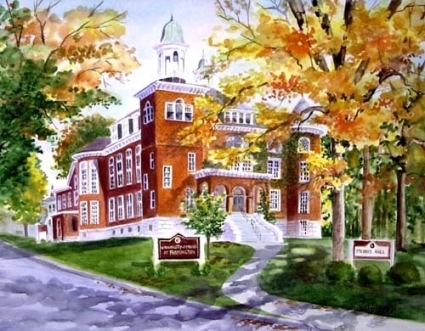 I found this watercolor of UMF as I was searching for a sunny picture of the campus. What a find! Check out more of her artwork here: http://www.dailypainters.com/artists/artist_gallery/774/Nita-Leger-Casey. Winners will be contacted next week and honored at the game on May 1st. It’s a fun promotion that has yielded many tremendous poems!